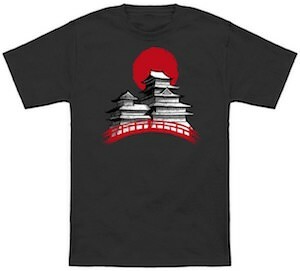 If you want a Japanse style t-shirt then this bridge to Japan t-shirt is what you want. The t-shirt is available in men and women’s styles and a bunch of colors and in sizes Small – 6XL. 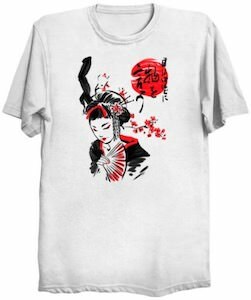 On this 100% cotton t-shirt, you can see two classic Japanese buildings with a red circle in the sky that looks like the moon but also is on the flag of Japan and to bring a bit more red into the design it has a red bridge in front of the amazing looking buildings. 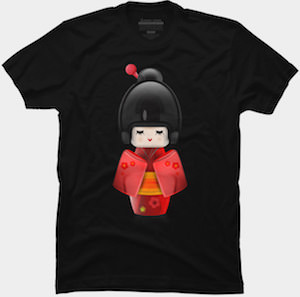 It’s a great design especially if you like the amazing Japanese building styles.